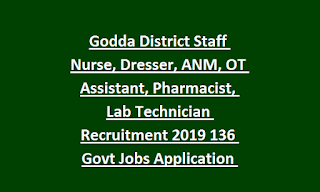 Godda District Health Dept Staff Nurse Jobs: 136 Staff Nurse, Dresser, OT Assistant, Pharmacist, Lab Technician and ANM Posts are released by Godda District Health Dept under DMFT. Candidates who are interested in these Staff Nurse, ANM, Pharmacist and other vacancies they can submit application form to Godda District before the closing date of 12-02-2019. Download application form from official website of www.godda.nic.in. Candidates selection is based on merit in qualifications, work experience and documents verification for this Godda District Health Department jobs. 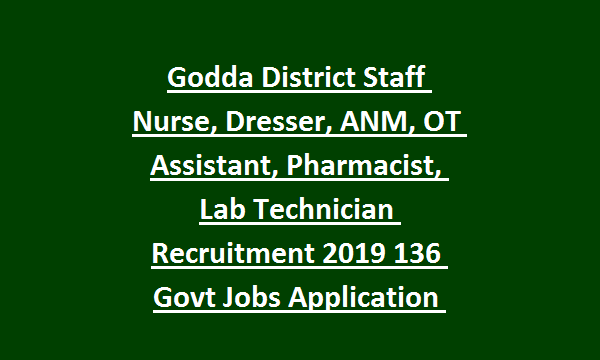 Qualification,salary, application form link, vacancy details and other details about this Godda District Staff Nurse, ANM, Pharmacist, jobs recruitment notification 2019 is updated below. There are total 136 posts are in this Godda District Health Dept, recruitment 2019. For all the posts age limits are 18-45 years. Candidates will be selected based on merit in qualifying exam, work experience and documents verification. Candidates have to submit application form to Godda District Health Dept before the closing date of 12-02-2019.